The more I researched and learned about Apples I soon realized how true the old saying “An Apple A Day Keeps The Doctor Away.” Now I know precisely why they have so many health benefits. I have been a fan of apples, for as long as I can remember. I consume them very often, and I encourage you to do the same. 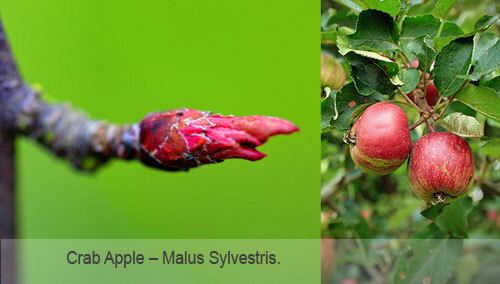 They are always best when from an organic farm and even better when obtained from the wild – Crab Apple – Malus Sylvestris. At this time of the year, Autumn, go hiking on a mountain. Looking for apples is such a delight, and they are free of charge. Apples are one of the most healing fruits on earth with surprising mind boggling non-glucose sugars for which I have a great chemistry respect, their many organic and phenolic acids, sterols and diols, etc.… A renewed interest in phytochemistry is what this plant did for me. Nature never seems to stop amazing me. So many are looking elsewhere in remote places around the world for new drug discoveries when right here above our heads are many pharmacological answers for the “picking”. Plants that are endogenous to our environment are nearby for very good reasons. Are we so naïve to believe (not knowing) that the answer is hidden far away from reach? PSC® Vegetable Embryonic Serum (VESTM) Complexes that contain Crab Apple-Malus Sylvestris include: As Good As New, Cholesto Reducto, Daily Endurance, Herpecell Oral and Parasito Eliminato.